LONDON — While the Premier League's top teams were quiet on a low-key final day of Europe's winter transfer window, Hull and Crystal Palace were busy Tuesday in late bids for survival. There were no incomings at the top four teams in the league — Chelsea, Arsenal, Tottenham and Liverpool — who were all playing games on Tuesday night. With 14 of the league's 20 teams in action as the 2300 GMT trading deadline loomed, that proved an additional complicating factor for completing deals. "I'd go back to the open market, it is just a crazy situation," said Tony Pulis, whose West Bromwich Albion side drew 1-1 at Middlesbrough before signing Marc Wilson on loan from Bournemouth as defensive cover. "To have it on the final day and arrange games is just astonishing really." The only news coming out of Manchester United was manager Jose Mourinho saying Wayne Rooney wasn't for sale, amid regular reported interest from the Chinese Super League, and that winger Ashley Young also would be staying put, at least until the end of the season. 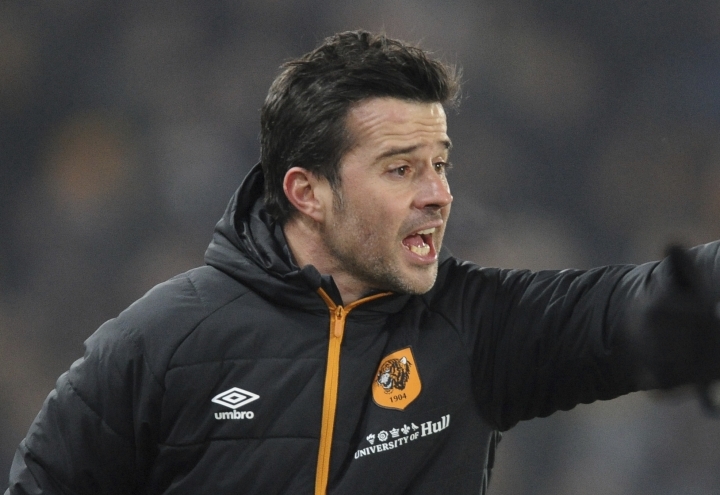 Most of the transfer activity was taking place at the bottom-place team, where recently appointed manager Marco Silva has been busy revamping the squad in an attempt to stay another season in the world's most lucrative league. Midfielder Alfred N'Diaye signed on a temporary deal from Villarreal until the end of the season, subject to international clearance. The 26-year-old N'Diaye is back in England after playing for Sunderland between 2013 and 2014. Italy defender Andrea Ranocchia also joined on loan from Inter Milan after making just five league appearances for the Italian side this season. He said he could not resist the lure of the Premier League and could get the most daunting debut imaginable — away to United on Wednesday. Heading out of the KCOM stadium were defender Alex Bruce and striker James Weir, both on loan to second-tier Wigan. Silva has already brought in defender Omar Elabdellaoui, winger Lazar Markovic, playmaker Evandro and striker Oumar Niasse this month, but has seen key midfielders Robert Snodgrass and Jake Livermore depart. The relegation-threatened club signed defensive midfielder Luka Milivojevic from Greek club Olympiakos on a deal through June 2020 and Mamadou Sakho joined from Liverpool for the rest of the season. Palace manager Sam Allardyce said he was hoping to bring in another player from Merseyside: Everton striker Arouna Kone. Players could complete moves after the 2300 GMT deadline if clubs completed a Premier League deal sheet. Odion Ighalo is swapping the Premier League for the Chinese Super League after leaving Watford for Changchun Yatai against his manager's wishes. Despite having signed forwards M'Baye Niang and Mauro Zarate from AC Milan and Fiorentina earlier in the transfer window, Watford manager Walter Mazzarri was disappointed to have lost the Nigerian striker. "I never make a player leave my club, especially a player that is a great person and great professional like Ighalo," Mazzarri said. "Sometimes there are offers and it's the club that decides. I have to do the best I can with the players that the club provides me." Midfielder Adlene Guedioura left Watford on Tuesday for Middlesbrough. The League Cup finalists signed 25-year-old forward Manolo Gabbiadini from Napoli. He has played six times for Italy's national team, scoring once. Gabbiadini will face competition from Jay Rodriguez, Shane Long and Nathan Redmond for a place in the team, while Southampton says striker Charlie Austin is making "encouraging progress in his return from injury." Goalkeeper Mouez Hassen also joined on loan from French club Nice for the rest of the season. Southampton plays Manchester United in the League Cup final on Feb. 26. Burnley broke its transfer record to sign the versatile Robbie Brady from Norwich. The northern club said the deal eclipsed the 10.5 million pounds ($13 million) it paid for Jeff Hendrick last year. Brady, who can play on the left in defense or midfield and central midfield, signed along with central midfielder Ashley Westwood from Aston Villa. Swansea signed striker Jordan Ayew from Aston Villa and defender Neil Taylor has moved in the opposite direction. Ayew, on Ghana duty at the African Cup of Nations in Gabon, scored 10 goals in 58 games for Villa. His brother Andre played for Swansea before making a move to West Ham last year. Swansea is two points above the relegation zone after beating Southampton on Tuesday. Steve Douglas reported from Liverpool, England.